… into one of your laptop’s USB ports. It will immediately set itself up, providing you with a steady connection to your broadband router. These adapters are readily available from high street retailers like Maplin for about £10-20. 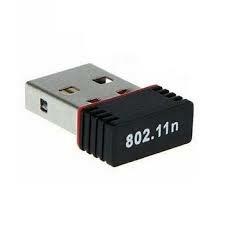 Click here Edimax EW-7811UN 150Mbps Wireless Nano USB Adapter to view one currently on sale online. Why you should use this security system? It allows you to tell your email provider what computers you will use to log onto your email. Any others are then viewed by them as untrusted and so a user will not be able to log on without verifying that they are really you! More valuable information on this topic to follow soon …..
DON’T use exactly the same password for more than one online logon. If one account is “hacked”, all your others may also be vulnerable too and you’ll need to change them all ! Ensure your email provider has your up to date phone number (ideally a mobile) and an alternate email address, so they can send you a “Password Reset” link if you ever forget it – or it’s not recognised when you try to log on. Set up “2-step Verification” for your accounts as this prevents anyone other than you from logging on. If they aren’t using a computer which is known to Gmail (for example), they’ll be asked to verify their identity. Gmail, Hotmail and Yahoo offer this feature – sadly BT Internet email addresses do not, despite using the Yahoo service! Be wary of following links in emails you’re not expecting – and NEVER on any which are for logging onto your account, as they’ll probably lead you to a fraudulent website which may look like the genuine one. Immediately delete any emails you receive claiming to be from H M Revenue and Customs (perhaps offering a tax refund) or a bank (perhaps suggesting a problem with your account). If your email account has a toolbar button called “Spam” or “Phishing”, use this to report this to the provider. Consider using a separate account (to your personal account) for entering competitions or signing up to newsletters to limit your receipt of spam emails. Whenever accessing your email account from a public computer (such as your local library or an internet cafe), ensure that you do NOT allow the browser to save your password and log out completely before leaving the workstation.